Zion is a congregation that believes the Holy Bible is the inspired, inerrant Word of God which forms and informs what we believe and how we worship. The Bible tells us of the story condition of sinful humanity and the depths of the love of our Heavenly Father. This love finds the fullness in the person and work of Jesus Christ, who being the Son of God, became human in His birth of the Virgin Mary and offered up His life to win the salvation of all humanity. This AMAZING GRACE is what makes us His children and leads us to reach out to those around us. This undeserved love is proclaimed from our pulpit in every worship service and taught in our School and Bible Classes. This is the history of our church congregation and the various houses of worship used by the membership. A story of growth, challenges, and above all, God's love. In 1847, itinerant minister Rev. Frederich Lochner began ministering to the German-speaking Lutheran families of Staunton in their homes. 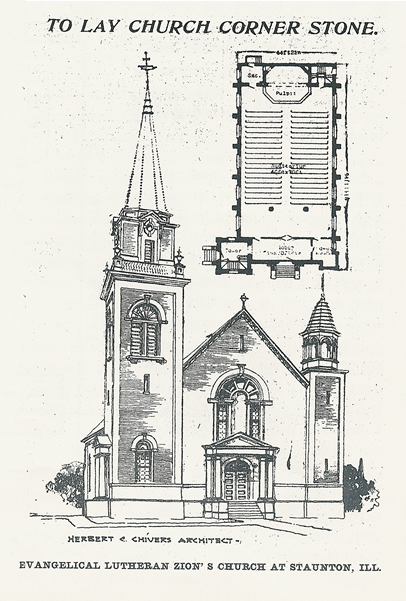 By 1850 the newly organized congregation used a frame house that served as both a church and parsonage. January 1851, Rev. John Reizner was installed as the first resident pastor. Members constructed a new frame church in 1854 to house the growing congregation. On March 2, 1856, the congregation joined the Lutheran Synod of Missouri, Ohio, and Other States. Education became a part of our congregation's history as far back as 1858 when church records reveal Pastor Reincke conducted school classes several times a week in his study. In 1859, school classes began meeting in the church. The local pastor continued to teach until 1865 when C.Haas became the first resident teacher. 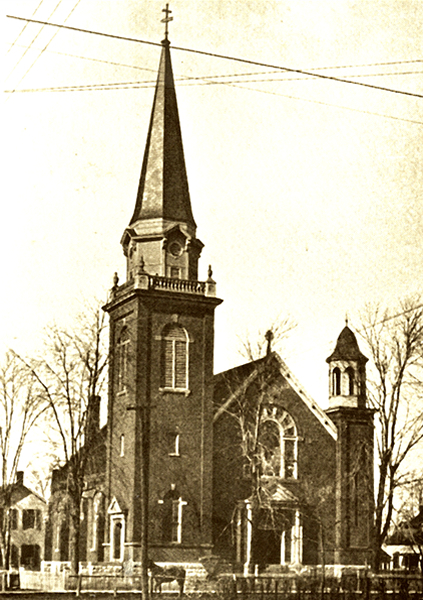 The first school building was located next to what is now the church on Elm Street. Sometime during the 1870's a second school building was built. As time passed, the size of the congregation continued to expand. 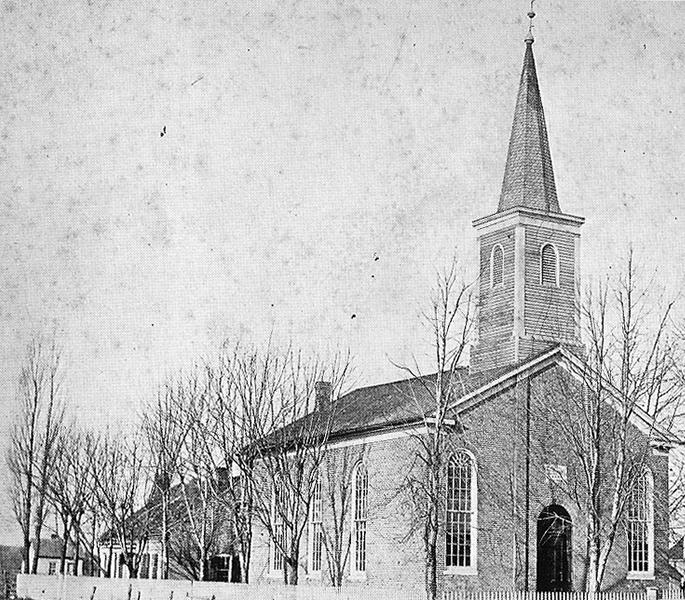 Therefore in 1863, during Pastor R. Vogt's ministry, members built a larger church located on the sight of the present building. During Pastor Gotthold Kuehn's ministry (1890-1904), the congregation realized that once again the house of worship had grown too small. Members decided to build another house of worship. 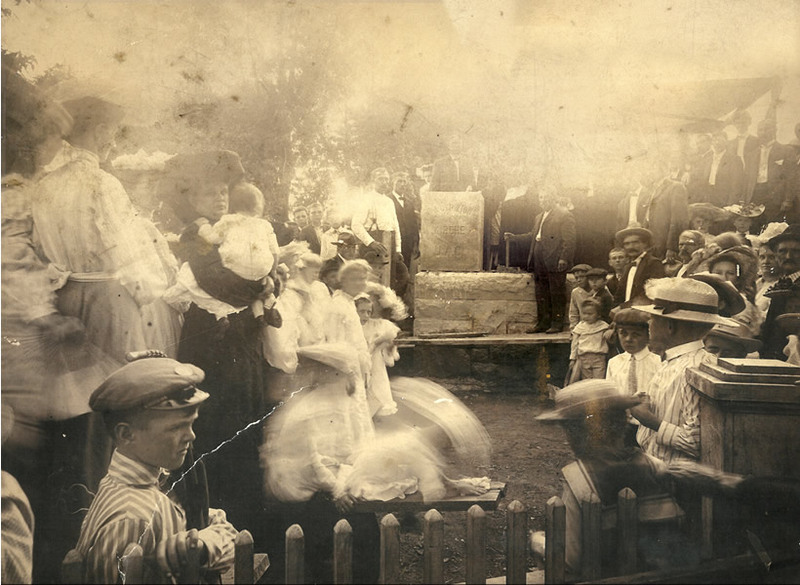 On August 14, 1904, the cornerstone of our present church was laid. Rev. A. Almstedt of Granite City and Rev. John Andria of Braunschweig Church delivered the cornerstone dedication addresses. Construction was completed in a little over a year. 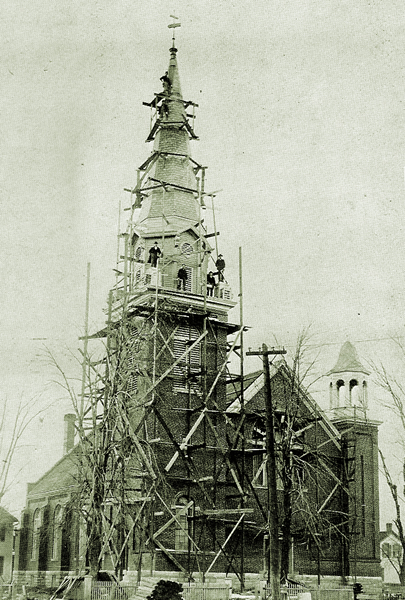 Builders took time out in 1905 to have their picture taken with their nearly-completed project. Dedication ceremonies took place on March 12, 1905. Rev. M. Daib of Troy, Illinois, delivered a morning address, and Rev. Frederick Brand of Springfield, Illinois, delivered an evening address. The new church, surrounded by a picket fence sat firmly on a foundation of Grafton rock. The remainder of the building was constructed of pressed brick. Its main steeple towered to a height of 127 feet. Contained within the bell tower were three bells, one from the old church and two new ones. The church had a seating capacity of 400 and cost $20,000.00 to build. At the time of the dedication, the congregation had 500 communicant members. It supported one pastor and two teachers who instructed 147 children. It also provided homes for the pastor and two teachers. 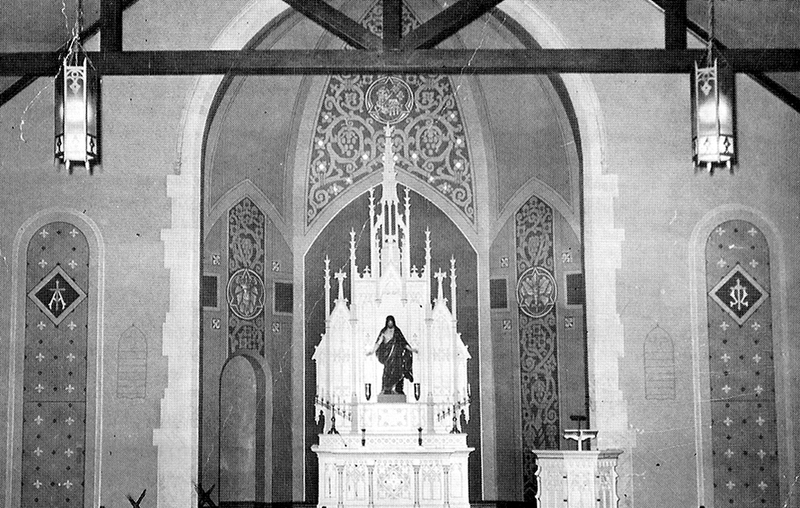 In 1905 the interior of the new church featured ornate fixtures, lights outlining the chancel, and the pulpit on the south side of the altar, resting on a tall pedestal. The Ladies Aid purchased the church pews, the altar and the pulpit, the statue of Christ, altar covers, and carpeting around the altar. 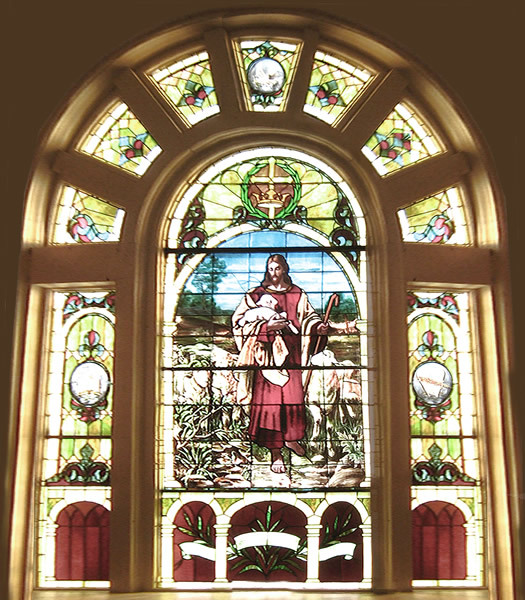 The stained glass window of the Good Shepherd was donated by school children when the church was built. Organ music has always been an important part of Zion. 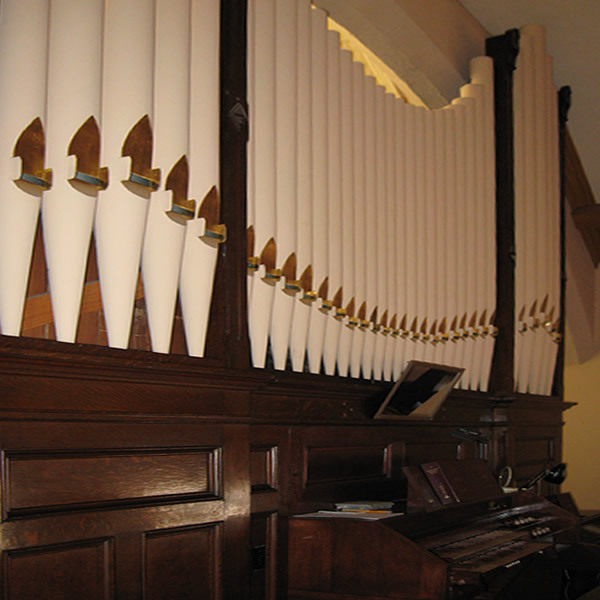 The original handpumped organ was replaced in 1908 by a more modern instrument. Various repairs and improvements to that organ have been made throughout the ensuing years. In 1948, chimes were installed in memory of World War II service men and women. In 1996, a new hand-crafted console was installed and the organ was again rebuilt. 1847 - Friedrich Johann Carl Lochner refers to a Lutheran parish served by himself in the village of Staunton. He was an itinerant pastor meeting in peoples homes. 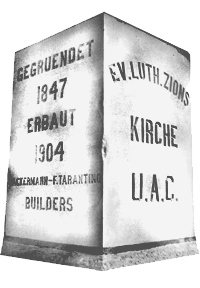 1851 - Congregation adopts the name "Zion German Evangelical Lutheran Church". Pastor John F. Reisner becomes first resident pastor. 1854 - First church building built ....cost $125.00; Zion recorded its first marriage and first confirmation class. 1905 - English services held for first time (once a month on Sunday evenings); Ushers are introduced. 1929 - Great depression begins. Many church members out of work, contributions to church dwindle. Decreased enrollment & financial burdens force congregation to close one classroom. 1936 - Ladies Aid granted permission to install a kitchen in school basement. 1937 - Ladies Aid contributes $721.58 to have bathrooms installed in school basement. As a show of faith, trustees are instructed to rid the school grounds of the old "outer" buildings; WPA Band given permission to hold performances for school children. 1942 - Pastor Kleinhans passes away, serving Zion congregation for 33 years; Congregation resolves to have church constitution translated into English and Lenten services are conducted only in English, Ladies Aid donates loudspeaker and microphone system to church. Ladies Aid also contributes $659.35 for redecorating school auditorium and stage. 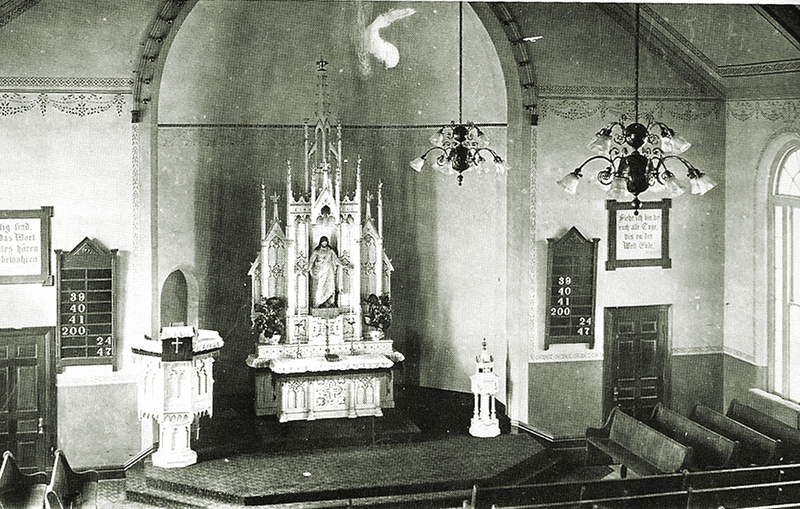 1943 - Church redecorated; Loudspeaker and microphone system are removed because it was felt they were "too modern". 1950 - Modern age officially dawned at Zion - church purchased its first power lawnmower; Present church redecorating begun - steel rods, boxed in to look like beams, which spanned the width of the church to prevent the walls from spreading due to weight of roof, radiators were relocated and covered, lighting was updated, The pulpit was removed from its high stand and moved to the north side of church. The interior was then repainted. Outside the church was tuckpointed and repainted. New steps and railings were added and the outside grounds were landscaped. The total cost of the project was $17,000.00. In addition, 700 hours of labor were donated by members. 1963 - New lectern and baptismal font were dedicated. 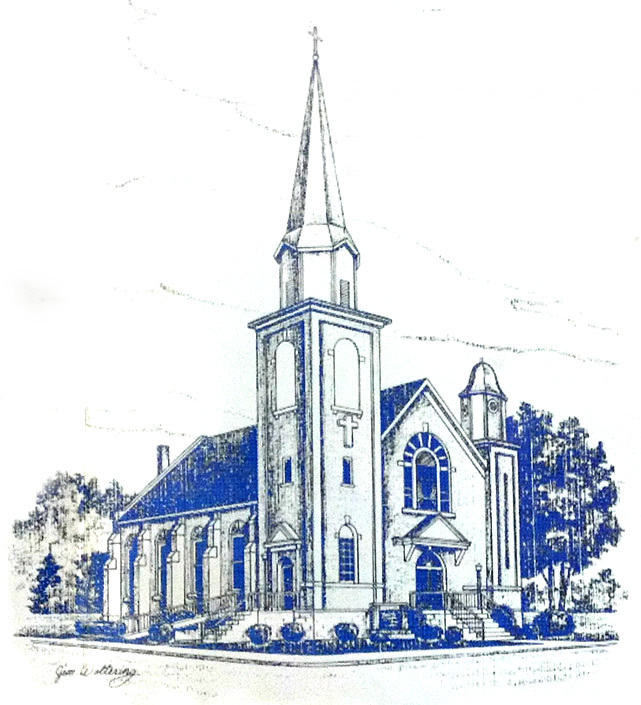 1972 - Church celebrates 125th anniversary; The walls and part of the ceiling of the church were canvassed to prevent cracking, the interior was completely repainted, paneling was placed in the narthex, and carpeting was laid over the entire nave, narthex, and balcony. 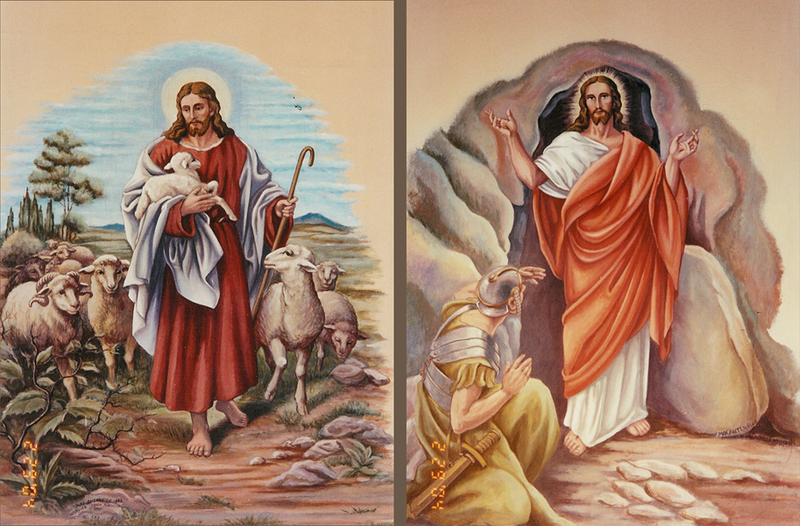 The two murals were retouched. 1981 - Organ rebuilt and rededicated. Chancel remodeled, adding new communion railing; Eternal flame was donated. 1987 - Another redecorating project for the church included among other things, painting, lighting, stairway, and guttering improvements as well as the addition of mail slots for each of the congregation's families. Windows in nave doors serve to illustrate the name of Zion. The windows are the work of Herschel Wilson of Worden, meaning to state clearly: "We are the Lord's Zion whom the Lord is leading to Zion. "; Autenrieb Art Studios of Edwardsville are engaged to repaint the church interior; Voters accept proposal to build an addition to the west end of the church building, connected by a bridge-type ramp. 1988 - As the needs of the church expanded more office space was needed, the Parish Center was built and connected to the church, containing offices, meeting rooms, and a reception area. 1996 - Electric altar candles and Advent wreath candles are replaced with oil candles. Students in sixth thru eighth grade participate as Acolytes during worship; Portions of church's exterior are tuckpointed; New exterior doors are donated and installed; In commemoration of 150 years of Zion, original cross from steeple of church is housed in brick display at east entrance; Church organ is rebuilt; School undergoes updating. Bathroom facilities are upgraded and new wiring is installed in older sections to accomodate computers. See Something Missing or Misplaced? Contact the Church Office and Share Your History!